The SUBOX Mini Kit is perfect for those who want to vape in style but not wanting to sacrifice great quality vapes. 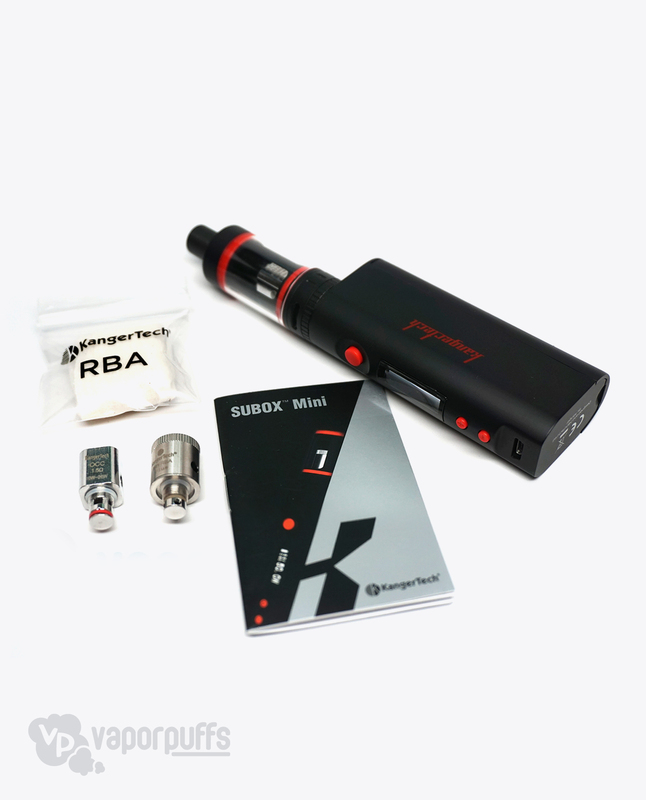 The Subox Mini Kit by Kanger offers variable wattage, multiple OCC coils, and an improved RBA headline to ensure the best vaping experience possible. Earn up to 540 Puff Points. 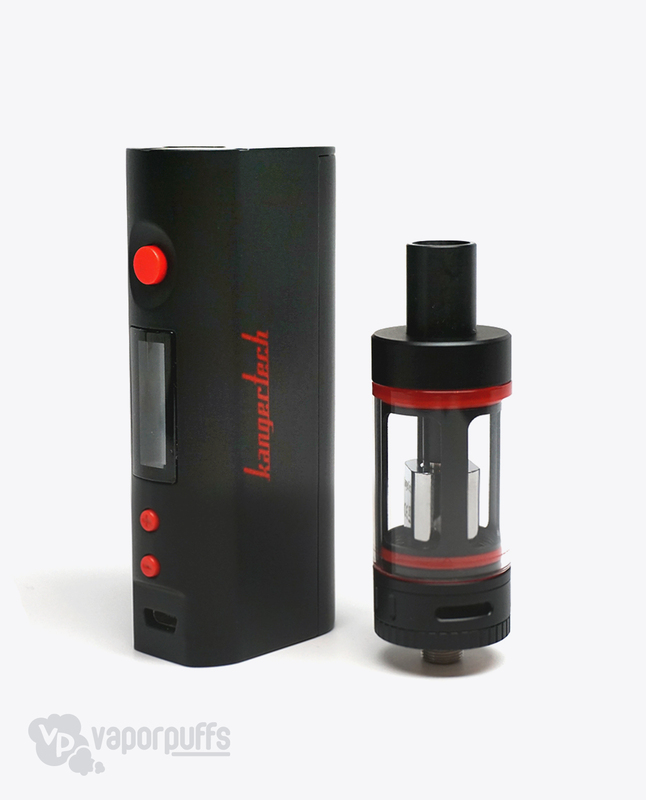 The long anticipated Subox Mini by Kanger has finally been released and is one of the most in demand box mods available on the market right now. 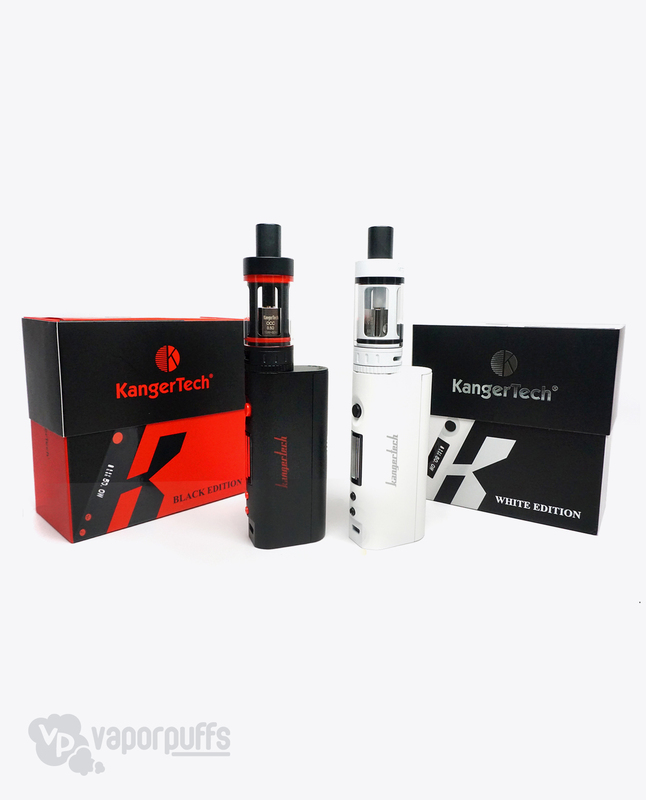 The SUBOX Mini kit by Kanger pairs both the KBOX Mini and the Subtank Mini in one package for a mini match made in heaven. Including two different OCC’s (0.5 Sub Ohm and 1.5 Ohm) and a variable wattage system, the SUBOX Mini Kit is packed full of great features and unlimited options. This kit features a new airflow design for maximum vapor and flavor production. To accommodate new users, it is made with an easy to assemble RBA to help keep things simple. It has it all, top quality for the experienced and ease of use for the newcomers. The SUBOX Mini Kit is available in a sleek looking black with red accents and a classic white with black accents to compliment any vaper’s style. And just in case our technical support can’t fix your issue, the SUBOX Mini Kit you purchase on Vaporpuffs is covered by a 6 month limited warranty. The warranty covers all manufacturer defects and all warranty replacements go through us. No need to search for manufacturer phone numbers and jump through hoops.Let us do all the work for you! Bought this from here 4 months ago, have had nothing but positive things to say about it. Chose vapor puffs because they were far cheaper than my local store. Totally worth every penny! This starter kit is truly amazing. The best thing about this kit is the easy to refill and the smoke production is truly fantastic. I keep my mod voltages at around 27.7 and 28.5 which is perfectly fine for me. This is a perfect starter for anyone who wants to start vaping and from a person who frequented a couple cigarettes per day, vaping really helped out with the addiction. This kit isn’t like other mods where they are complicated and they require constant attention, this kit is easy and (yes I say again) amazing. Like for any mod, just make sure you moisten the wick but not too much or else it would gurgle and even some of the e-liquid would be tasted. Though this is completely my fault for not fully following directions, for even with this the mod still works perfectly. This is my second one, the first one I lost unfortunately but I know I am going to keep a better eye on this one. Best mod out there for simple and easy clouds. This is an awesome deal for newbies and pros alike. Had my subox mini for about 2 weeks I absolutely love it !!!! this is my 3rd box mod. I have a smok tech and a kbox. This is my favorite. It looks sleek, Love the fact that you can change the battery on the side (vs the kbox). It charges quick. The rba is a great way to start rebuilding. I can’t say anything wrong about it. I wished I ordered it on here. But I will be buying the nano here. The best!!!!!!!!! I have had this since June and i love it nothing bad to say. I use this every day. I absolutely love this vape. Best money I’ve ever spent on anything vape related. When I lost my first one in Vegas, I felt naked and immediately ordered another one. The second one had a minor issue which Vaporpuffs was quick to help me with and get me a replacement. The service is extremely quick and courteous. I highly recommend this setup and ordering it through Vaporpuffs. Just bought this and I absolutely love it already. Cheap price out of every website I looked at. I will continue to purchase products from here. Just ordered this beast early Monday morning. Came to my door in NY on Wednesday. Thank you so much for the fast shipping!! Now about the subox… So far I’m really enjoying it. Couldn’t decide if I wanted the black or white, but I went with the black and it looks and feels very solid. So far vaping has been great with it, at first was a little weak, but I guess it takes a few minutes for the coil to warm up. Now that its broken in its vaping great! I really have to get some lower nic juices though, because this subox is so much stronger than what i was using before. Thanks Vapor Puffs will order from you again! Just excellent. Whether you’re a beginner or advanced, this is the perfect kit. Looks incredible and has everything you need but the battery and juice! I have just received my white subox! I really like it. I upgraded from an itaste mvp 2. I am really impressed, the look and feel of the device is top quality and the vape is awesome. First time ordering from vapor puffs. I ordered on July 4th which was a Saturday and holiday. I received my package on Thursday. I’m really impressed with vapor puff and would order from them again. If you are thinking bout this device and want to step up your vapor game go ahead and buy it!! This is an awesome little kit! It fits nicely in your pocket. I already own a Subtank Mini but just had to have this setup. Customer service is top notch and delivery was fast and free! This kit is ridiculously easy to use and the vape is great as far as clouds and flavor goes. Quality and build have been great as well and I’ve had no issues with the tank or box. The only problem I had was my shipment was delayed about a week because the shipment got damaged, however Alexa from customer service was very quick and helpful to get another one turned around for me. Great customer service! First of ALL I give this company an A+. I was hesitant to order from them at first since I had never heard of Vaporpuffs.com, but I couldn’t be happier with my purchase from them. 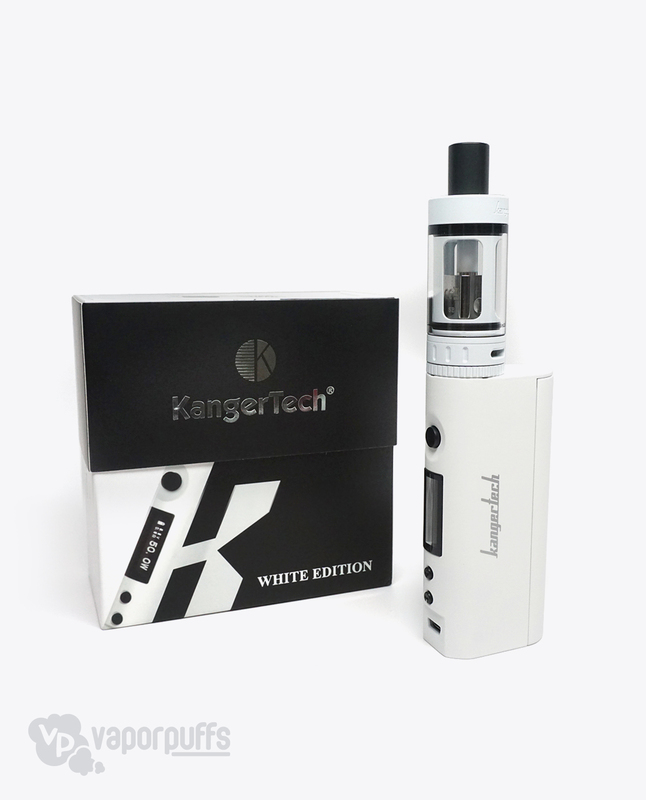 I ordered the white Subox kit on 6/24 knowing they did not have them in stock until 6/26, and at a discounted price ($66.91 OTD due to their awesome customer retention program) with FREE 1-3 day FIRST-CLASS shipping. Not only did they have the item in stock on the day they advertised, they sent out my item within the first hour of 6/26 and it arrived on 6/27 only 36 hours after leaving their place in Philly (I’m in CA). Crazy good service, price, etc. I will be coming back! Oh yeah, and the Subox kit is also a 10/10. I upgraded from my struggling ego twist and couldn’t be happier with the product Kanger has come out with. The whole kit is a great value and quality I would highly reccomend picking one up if you’re on the fence – especially from these guys as per my awesome experience with their service and price. Cheers! Graduated to the Kanger Subox from and eVod, and let me tell you, this is a great device for people like me who are starting into sub-ohm vaping, and vets who have done it for years. The construction is fantastic, feels very solid in your hand, and the fire button is perfectly placed. Not too heavy or bulky for your pocket, and not so light that it feels cheap and will fall apart in my hand. My advice, get it. You won’t be disappointed, and the vape is absolutely fantastic. Don’t let the “Mini” in the title fool you!!! My friend got the new subox and after testing it out, I knew I had to get one, the new design is amazing, the white just has this futuristic look to it. I would recommend this to anyone, first time or a veteran vaper you must had this to the collection! This a great kit with an even better price. Absolutely love this thing. The free 3 day shipping is also a big plus considering not very many websites offer that option. This is an awesome starter kit! Shipping was free, and furthermore, extremely fast. I also received a free bottle of ejuice. My local vape shop sells the tank for $50, so you essentially get the mod for $20. It’s a great value. This is an incredible kit for an incredible price. Everything that a beginner vaper needs is in that kit, minus the battery. Awesome job, Kanger! Been using the Subox Mini for 2 days now. I absolutely love this thing. You guys are awesome. Thanks!